Given how many years I’ve been doing research on sax-shaped/named things, I find it odd that until June 2014, I’d never come across a Saxette. This is especially strange given how popular these little instruments appear to have been in the late 1920s and 30s. When I first entered Saxette into the search bar of Google, I was absolutely amazed at how many hits the term the returned. 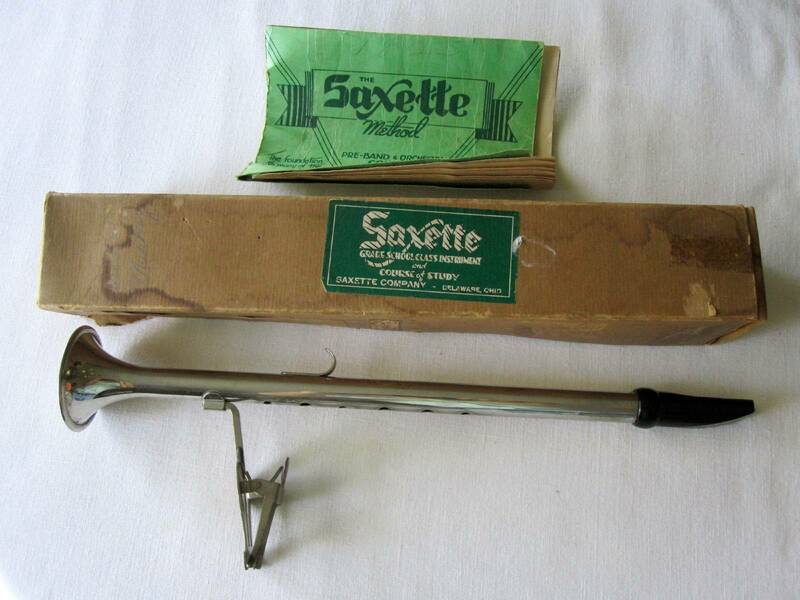 The Saxette was invented by a music teacher by the name of Elver Joseph Fitchhorn, from Delaware, Ohio. Fitchhorn invented the instrument as a way for children, as well as others, to begin learning to read music and playing a musical instrument. The following articles provides us with an example of how the Saxette was used at the time. The one on the left is from the November 11, 1933 edition of The Ohio Wesleyan Transcript, from Delaware, OH. The one on the right is from School Chatter section of The Herald-Mail, from Fairport, NY. It was published on March 28, 1935. 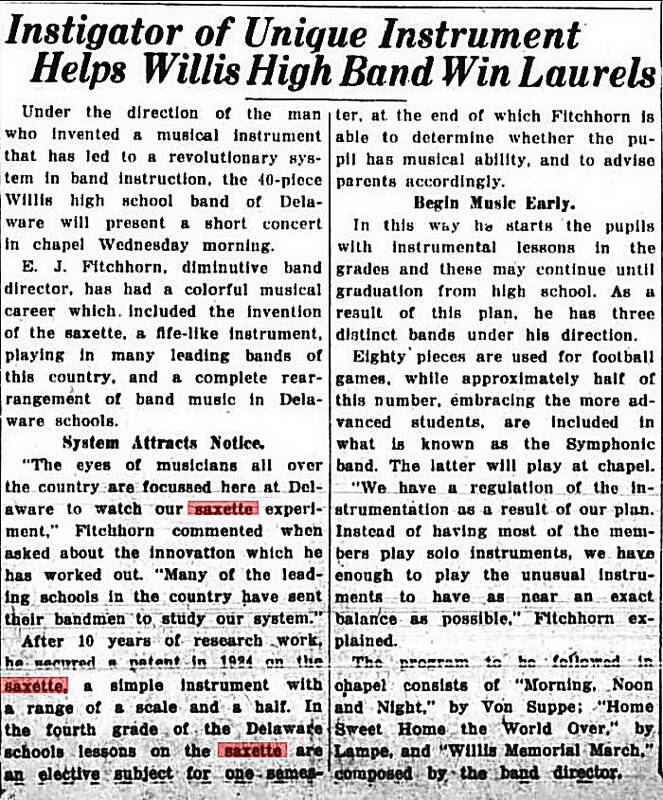 Note: Although the text is hard to read, it appears to say in the above article,”Instigator of Unique Instrument Helps Willis Band Win Laurels”, that the patent for the Saxette was obtained in 1924. That is not correct. No doubt Fitchhorn worked on his instrument for years, and could easily have been working on it in 1924 already. However, Fitchhorn has no patents listed to him prior to 1939—the Saxette was patented a full six years after this article was written. I wonder what the article is referring to? • It was related to instruments of the flageolet, flute or clarinet type. • It provided a simple, inexpensive instrument that was particularly adaptable for use by children, wanting to learn how to read music and play an instrument. • It would be made of a metal, tubular (read cylindrical) body, which ended in a flared bell. • The body tube had multiple tone holes of varying diameters. • On the back of the body tube, just above the bell, there was a tone-regulating opening. • It had a right thumb rest. • It had a lyre holder. • The mouthpiece was made of plastic. • Due to its construction, this instrument plays in the key of G, in perfectly in-tune octave intervals. • The instrument’s flute-like tone is in large part coming from the large resonating chamber in the mouthpiece (12 in Fig. 3 of patent drawing). The Saxette vs. the Clar-O-Sax: What are the differences? If this instrument looks a lot like Conn’s Clar-O-Sax to you, you’re likely not alone. Until I did some research on these two instruments, I too thought that they were quite similar. I wondered: 1. How Fitchhorn got a patent on the Saxette, 2. Which came first, and 3. If Conn ever pursued any action him for copying their idea. I don’t have the answer to # 3 yet, since I haven’t done any research on the subject, but based on what I discovered on #’s 1 and 2, I rather doubt it. Here’s a chart comparing/contrasting the Clar-O-Sax and the Saxette. You be the judge. Mouthpiece construction Plastic piece with baffle and chambers that does not require a reed. Uses a removable (sopranino saxophone?) mouthpiece with the usual reed held on with a ligature. It is worth noting that in their patent application, Conn used the word “saxophone” no less than 16 times to describe the Clar-O-Sax, while Fitchhorn didn’t mention it once. That makes sense since Conn’s instrument had a conical bore, while Fitchhorn’s had a cylindrical one. By definition therefore, the Saxette cannot be any kind of saxophone, since a horn must have a conical bore to be considered a saxophone. Obviously the biggest difference between the Saxette and the Clar-O-Sax was the mouthpiece. Conn’s Clar-O-Sax used a removable mouthpiece that was either the same size as, or even the same as a sopranino saxophone mouthpiece. The Saxette however, appears to have had a fixed mouthpiece. This mouthpiece did not require the use of a reed, but rather simply required a player to blow through the carefully constructed chambers to produce the instrument’s sound. No fuss no muss. Those of us who spend our lives fiddling with reeds can certainly understand the simplicity and ease of this method. This easy method would be especially advantageous for young, beginning players. It is curious that it took the United States Patent Office nearly a full two years to issue the patent for the Saxette. Why would that be? Was 1937 just a very busy year for patent applications? Or were they perhaps investigating the differences between Fitchhorn’s Saxette and the Clar-O-Sax? It’s likely the case that we’ll never know. No discussion about the Saxette would be complete without mentioning that the Library Of Congress has some information about this interesting instrument on file. Not only does the it have information about Fitchhorn’s instrument in its records, but the Library Of Congress has two different versions of the Saxette in its collection. – Key Holes System: 0/6 holes. Holes outline a scale as starting with all 6 fingerholes closed. – Physical Description: 1 piece, cylindrical. See DCM 1288a. [See example immediately below.] The fipple end is modified with a plastic mouthpiece. The Langwill index refers to this instrument or the patent for it as a “Song Flute.” Compared to DCM 1288a, holes are drilled in the normal manner. – Mark Additional: Mark on foot. Lyre marked with monogram. Nickel-plated brass, bakelite mouthpiece. ; 37.8 cm. 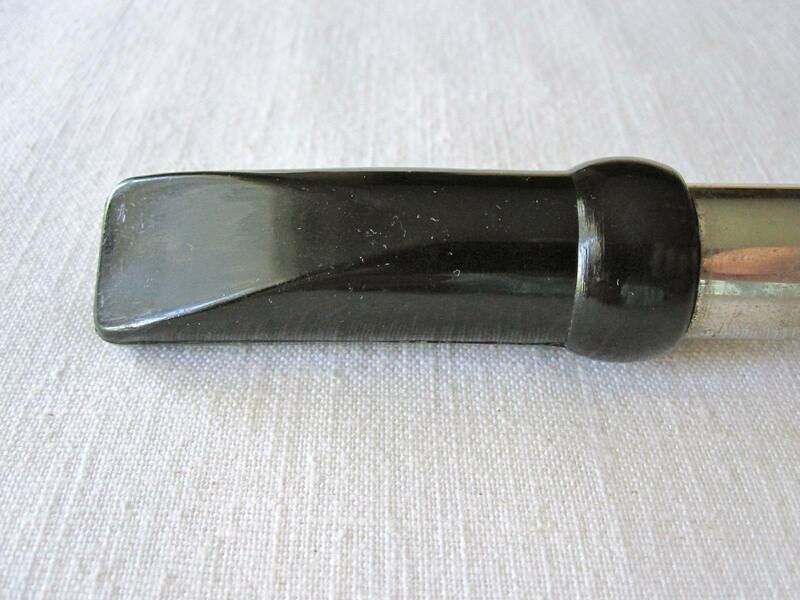 The second example that the Library Of Congress has does not have a bakelite mouthpiece. It appears to be an earlier model. Note that it too has a Pat. App. for stamp though. 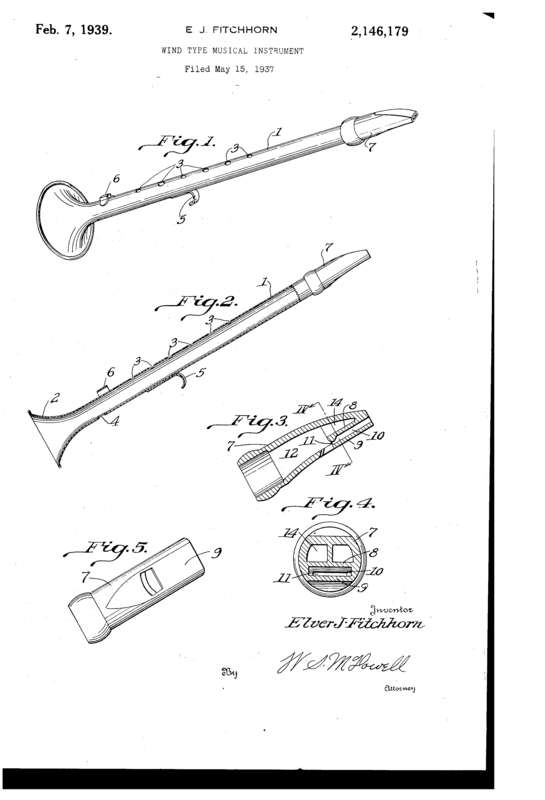 One can only presume that the patent wasn’t granted, and that Fitchhorn retooled his invention and added the bakelite mouthpiece in the design that did finally receive the patent in 1939. – Physical Description: 1 piece. Sheet metal cylindrical tube, extruded, to which is silver-soldered a spun bell with roll-back bead. Music lyre attached. – Mark Additional: Mark on foot. – Provenance: E. J. Fitchhorn, of “Saxette Company,” Delaware, Ohio, 30 June 1936. As I mentioned at the top, the Saxette first came to my attention when a rather lovely example of one appeared for sale on eBay in June 2014. Here are the photos. Oh, I should mention that it sold for the Buy It Now price of $75. Another Saxette appeared for sale on eBay in May 2015. This one didn’t have any accessories with it, but was in decent shape. It sold for $30.00.